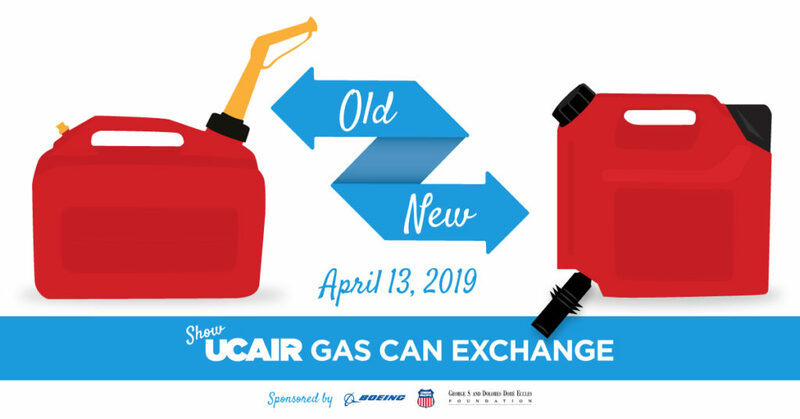 UCAIR has partnered with Boeing, Union Pacific and the George S. and Dolores Doré Eccles Foundation to launch the ShowUCAIR Gas Can Exchange program. The Exchange is a free program that is open to all residents of non-attainment counties in Utah to exchange their old gas can for a new Environmental Protection Agency (EPA) compliant gas can to help reduce emissions and improve Utah’s air quality. All gas cans will be exchanged for new 2+ and 5 gallon SureCan gas cans. When: Saturday, April 13, at 8 a.m.
All gas cans will be exchanged for new 2+ and 5 gallon SureCan gas cans. During the 2015 ShowUCAIR Gas Can Exchange, 4,688 old gas cans were exchanged resulting in emission reduction equivalent to taking 540 cars off the road per day over the five-year-life span of the gas can (DAQ). In 2015, DAQ scientists estimated that there were 772,000 gas cans in PM 2.5 non-attainment areas which produced roughly 2.9 tons of VOC emission each day. The goal of the ShowUCAIR Gas Can Exchange program is to take another 1,000 of these pre-EPA standard gas cans out of commission and replace them with new, EPA-compliant gas cans for a cleaner, healthier Utah. Prior to 2009, portable fuel containers had volatile organic compound (VOC) emissions of 1.5 grams per gallon per day. As of 2009, the EPA requires standard limits of emissions from fuel containers to 0.38 grams of VOCs per gallon per day — a decrease of 75 percent. The new EPA-compliant gas cans emit 78 percent less benzene — a hazardous carcinogen — and reduce emission permeation of VOCs. These last four emissions can be hard to quantify, but the EPA estimates one can emits around eight pounds of VOCs each year through spills and vaporization. How Do the New Cans Help? EPA research indicates that the level of VOCs indoors is consistently higher, up to 10 times more than the level of VOCs outdoors. The most effective way to limit VOC’s indoors is to limit the potential sources. People with respiratory problems such as asthma, young children, elderly and people with heightened sensitivity to chemicals may be more susceptible to irritation and illness from VOCs.